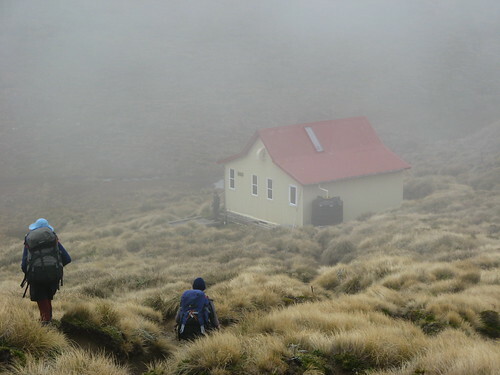 A clouded in Kime Hut on the exposed tops of the Southern Crossing, Tararua Range. fallacy [fal-uh-see]. 1. a deceptive, misleading, or false notion, belief, etc. : That the world is flat was at one time a popular fallacy.. 2. a misleading or unsound argument. 3. deceptive, misleading, or false nature; erroneousness. 4. Logic. any of various types of erroneous reasoning that render arguments logically unsound. The Hut Fallacy. 1. a deceptive, misleading, or false notion or belief prevalent in New Zealand outdoor circles that the objective of reaching back-country huts can reliably replace additional measures of safety. 2. a presumption that plans work, judgement is always perfect and/or that accidents only happen to other people. I hope nobody minds me defining this term, at the very least for my own purposes. Despite this kind of thing happening often, I don’t know of a quick and easy term to describe it. I think The Hut Fallacy is something that pops up often in New Zealand’s back-country. Huts have existed in the New Zealand back-country for as long as people have had reason to use them, but the first dedicated tramping huts were only built around the 1920s, and from the beginning they were built with safety in mind. One of the early and well documented efforts was in the Tararuas, where a group of advocates including people such as Willie Field and Frank Penn, convinced New Zealand’s fledgling Tourist Department to sponsor the development of what eventually became the Tararua Southern Crossing route. Track cutting was only part of the work, as it was eventually decided that huts were necessary for the safety of tourists on the route*. This was all happening at about the same time as the very young Tararua Tramping Club organised its first official club attempt to cross the range, in January 1922. Thanks to the lack of a century of experience now available, the group was woefully under-prepared by today’s standards. They had limited clothing and shelter, coordination and planning was loose, and many safety technologies available today hadn’t yet been invented, including waterproof clothing. A tragic consequence was that one member of the party, Harold Freeman, died of hypothermia in the exposed vicinity of Alpha Peak. For many of those involved, in a context where people were still discovering how to visit the outdoors with very little experience or peers from whom to learn, the disaster would have been the first realisation that tramping in New Zealand mountains had potential to be far more dangerous than a simple walk through the park. New Zealand’s back-country now has roughly 1,000 huts (the exact number depends on who you ask) of a variety of origins from dedicated tramping huts, hunting huts and what began as private batches. With few exceptions, they’re typically open entry for use by anyone on the condition of paying for inexpensive hut tickets or an annual pass. A few huts, notably those on tourist-marketed Great Walks, are far more expensive and require booking in advance for regular use. All huts, however, exist at least in part for safety purposes. With a few exceptions, doors are unlocked for open entry, and an underlying rule is that they can be used by anyone at any time in case of emergency, booking or no booking. There are regions that have very few huts, but in general huts are common enough to be a major part of the New Zealand outdoor experience. The scattered nature of huts means that to reach a hut requires traversing a lot of terrain, and reaching a hut can be a fulfilling experience that involves far more than simply getting there. A person who’s visited a large number of huts in an area is likely to have an exceptional knowledge of the terrain, which is one reason why it’s common to meet people who like to tick huts off a list, or describe trips and features in terms of where the huts are. Having arrived, huts often have a lot of character that’s been built and maintained by the variety of interesting people who have visited, stayed in and maintained those huts over the decades. This is especially the case with some remote huts that see few people. Sometimes tramping in New Zealand is all about reaching the hut, and I guess propagation of this term as if it’s a definitive goal of tramping bothers me. It’s great, of course, to make the most of and enjoy huts, but I think what concerns me is an underlying impression sometimes present that huts are always present and frequent in tramping as cellphone coverage is on State Highway One. When a presentation about beginning tramping effectively tells people that reaching the hut is always the end goal of people going tramping (as did a powerpoint presentation I attended a couple of years ago), as if there’s no other reason to go tramping in New Zealand’s back-country and as if the hut is always reached, I think things can get mis-represented. Tramping safely, irrespective of the terrain (everything from great walk to off-track bush-bashing), is (or should be) about making good decisions at decision points so as to be able to reach points of safety, and being as confident as possible of not becoming stuck between points of safety… even if that means refusing to leave the one you’re at. Huts are one point of safety in the outdoors, and maybe this is where some of the confusion comes from. I start to get uneasy if I’m going out tramping with someone and discover they have a different attitude to me about huts, because typically this means they’re somehow of the frame of mind that huts are what makes tramping safe. In other words, “why take a tent fly when we’ve got the hut?” This is where the whole Hut Fallacy thing, as I described earlier, starts to become apparent. Well, there are plenty of reasons why it’s important to take portable shelter despite an intention to use huts. For starters a hut could be full of people already, it might be damaged or otherwise uninhabitable, or it might not even exist as a map shows it. Huts are moved and removed from time to time, and occasionally maps are just wrong from the beginning. The second potential problem is that of actually reaching the hut. It might be on the far side of a flooded river, the party might take a wrong turn or make a navigation error before arriving, or an unexpected injury might make it impossible to reach. The wonderful thing about portable shelter is that it’s like carrying a point of safety with you everywhere. Tents, fly’s and bivy bags can’t be used everywhere, but they can be used a lot, and it’s often surprising just how possible it is to effectively set up this kind of shelter in some places when a party becomes desperate. It’s a little extra weight, but I have real difficulty understanding how people get into a frame of mind where they see relying on huts alone as being a safe way to visit the outdoors. It’s a situation that goes beyond individuals, and I presume much of people’s attitude is shaped by those from whom they learn and associate. From time to time I meet groups and families in huts who haven’t given a second thought to their lack of shelter. We once met a large group from a tramping club, walking up an increasingly high river in the rain to an 8 bunk hut, and between 8 people they had a tent that would fit 3. The more experienced of these two people, both of whom died in the Tararuas last winter, was described as experienced by friends and family, yet the coroner’s inquest seems to imply that they didn’t properly check the forecast, made awful decisions, ignored advice, went into white-out conditions without appropriate navigation skills, didn’t carry portable shelter, and were ultimately driven on by the anticipation of reaching Kime Hut! It’s now emerging from the inquest that for this person it may even have been an habitual attitude. In another recent inquest, it’s emerged that the victim of a river crossing made a bad decision about continuing in bad weather, and then put herself in a position which made crossing the river imperative. I honestly don’t want to be too critical. I’ve rarely met people in the outdoors who aren’t wonderful people and have interesting insights into all sorts of things, and very few people are outdoors with an intention of taking unreasonable risks. I also hope people think the same of me despite whatever weird Mike’isms come along with me. (Honestly, pretty much everyone who visits the back-country is strange in their own interesting way.) I guess I just have severe difficulty appreciating how people manage to take safety measures in the outdoors so casually. Maybe I just think this way because of the people whom I’ve learned from, but I can’t help but believe that it’s an irresponsible way of doing things, if not for one’s own safety then for the safety of others to whom one is responsible, or of everyone who might inevitably become involved in search and rescue efforts. * In the 1920s context, the term “tourists” would probably refer mostly to those within New Zealand, even the Wellington and nearby regions, wanting to safely visit the mountains, rather than today’s common use which is typically about attracting visitors to New Zealand from overseas. ** The history books I’ve found only seem to refer to him as E. J. Kime, but through the magic of online government resources it’s now easy to search historic death certificates at Births, Deaths & Marriages Online, which reveal 24 year old Esmond James Kime died in 1922. Interestingly the National Library’s digitisation of historic newspapers also reveal a couple of references in 1915, including some examination results (E. J. Kime passed science examinations for both Magnetism and Electricty, and Applied Mechanics for materials and structures), and also an Esmond Kime — a young postal officer — who was admitted to hospital following a bicycle accident. Historic online resources are awesome. *** Information in the last few paragraphs was compiled from Chris McLean’s book Tararua: the story of a mountain range. This entry was posted in article and tagged article, change of plans, favourite, huts, search and rescue, tararua tramping club, tararuas. Bookmark the permalink. Like carrying a map and compass I also think, at least on any trip involving an over night stay, that it is our responsibility to carry some sort of shelter. No doubt we all plan trips, at least in mind, with blue skies, no wind, great company, and all empty huts. Rarely does it work out that way. I had a run in the mid 90’s to 2003-4 or so when rarely did I see a single tramper in the Ruahine, and shared a hut with people a few rare times. Even so, I always carried shelter and many times camped just because I wanted to, the weather dictated that I do, or just enjoyed being at a spot that cried out for me to stay. I have noticed in the past five years that has changed (not seeing other people), and particularly with increased helicopeter activity assuming the huts will be empty is user beware. I think the arrogance of helicopter operators in just assuming any party they fly in will have use of the hut is just very wrong, but perhaps another issue for another time. On a barely related topic, have you heard about the heli-hunting controversies of recent times? (Heli-hunting is mostly a rich international tourist thing where a NZ-operated helicopter will chase an animal to exhaustion, then drop down for the tourist to shoot the animal.) Local hunters find the entire thing very offensive and I’m not surprised. It sounds as if the Canterbury-Aoraki Conservation Board is at least likely to stop it within that region. I have been a tramper for quite a few years and have several times been thankful for carrying emergency shelter on even easy trips. two notable trips spring to mind almost immediately. One was a trip into an easy to reach hut, we got to the hut fine but a storm rolled in during the night and on the way out we got trapped by a flooded creek. We could have walked two hours back to the hut but decided to setup camp under a tent fly and monitor the situation. We ended up heading out the next day so had a unplanned although not too unpleasent extra night in the hills. The second was the first time I took my girlfriend tramping, again an easy trip but she had never been in the hills before and the track was not well graded, she was very nervous about where to put her feet and went much slower than we expected. It was a late start and drizzly weather so dark came quickly. After a while we just fly camped beside the track and carried onto the hut the next morning (we were planning to spend a day there anyway just exploring). Despite the un-planned night out the girlfriend had a great time on her first trip, because we were prepared for things not going to plan. tent flys are light and make great shelter, one lives in the bottom of my pack on any trip. Hi Gareth. Thanks for the comment and the stories. My 2 person Huntech bivvy is something I’m rarely without, unless I have something else arranged, and it gets a lot of use even when huts are part of the plan. There’s heaps of space under there. Despite the name it’s easy to get 3 people in with a trick or two. I guess I just have trouble understanding how people get an impression that it’s reasonable to go out for several days into an area with few people and unreliable (commonly no) communication, potentially dangerous weather, potentially risky obstacles, and not carry something that’ll keep them alive if things don’t go to plan. It’s not simply that people do it that confuses me, but that there are whole groups of people who don’t even see a potential problem. I’ve had two situations that relate to this. One was one Mike witnessed from being part of another group in the same area, where a member of our party severely damaged her ankle. It was an easy walk, we were only about 3 hours from the road end and it was only about 2pm on a sunny summers afternoon. However, our injured party couldnt walk out even with help, so we set up camp and sent someone to get help, in case it took a while. It was actually a cool experience, and everyone had a great time, camping next to the track, in a spot where Mikes group came through and couldnt figure out where we had found space to sleep! The other was almost a not-so-happy ending, and it came from simply not thinking ahead and being prepared enough. I had travelled up from Christchurch to Wellington for a long weekend and a tramp with Dad. I only had basic kit, and we didnt have a tent. We were ok with that because everything was only a short day from a road end if need be. Our “short day” wound up nearly needing rescue with Dad injuring his knee while trying to come out over Mt Reeves in a howling southerly with hail and no shelter even for lunch. Thankfully we managed to keep going and get out, but I definitely learnt a very valuable lesson (well, several!) from that trip. I’ve seen many, many trampers who are totally unprepared for the possibility of not reaching a hut. It’s quite frightening. Not only that, but many times my partner and I have had to lend our sleeping pads to campers who arrived late at a hut and were not prepared for all of the beds to be full! Thanks for the anecdotes. The more I hear about this kind of thing the more I wonder if it’s really common sense, because it doesn’t seem as common as I’d have assumed it would be. I guess at least part of it is all the fragmentation of people who’ve learnt about the outdoors from different places and people, some more reliable than others. I don’t think it hurts to go to the odd Mountain Safety Council course. They’re often targeted at people who prefer to do things independently rather than club and similar environments.